At CDI, we’ve been integrating podcasts for some time as offers into client campaigns, less so as standalone offers, more often as part of information kits alongside downloadable content such as white papers, or in content syndication programs where we have the freedom to swap out content if a particular asset isn’t performing well. As part of a compilation, podcasts add variety – even a certain novelty factor – to what might otherwise be perceived as more of the same: white papers, case studies, analyst reports, etc. As standalone offers, podcasts haven’t responded as well and seem to suffer the same fate as Webinars – that is, prospects view them as too much of a “commitment” compared to a white paper or something else they can download and consume quickly and selectively. That’s why I was intrigued recently to discover Veotag, a company that’s developed a nifty Web-based service that lets you display clickable text, called “veotags,” within an audio or video file. In the case of podcasts, the result is offer content that can be listened to selectively: if I’m only interested in a certain segment, I can skip directly to that part of the file. Also, the table of contents that appears in Veotag’s player gives the reader (and potential viewer) greater motivation to register for and listen to at least part of the podcast based on his or her specific interests. The result could well be higher registration and download rates (read: more leads), not just from podcasts, but from corporate videos and archived Webinars also. Veotag’s basic service is free, but the company will also develop custom players in tune with your brand or even a particular campaign. 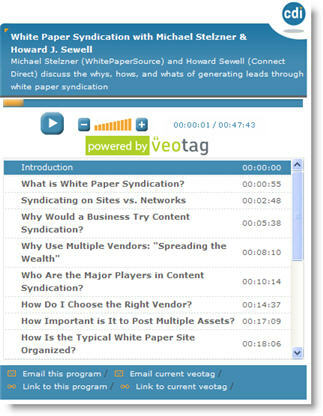 The screenshot you see here is for a podcast we recently produced with Michael Stelzner of Whitepapersource.com on white paper syndication. To register for the podcast and experience Veotag for yourself, click here. This entry was posted in Content Syndication, lead generation, Lead Nurturing, Offer Strategy, Online media, Webinars, White Papers and tagged Content Syndication, Podcasts, Veotag, White Paper Syndication on May 13, 2008 by Howard Sewell.